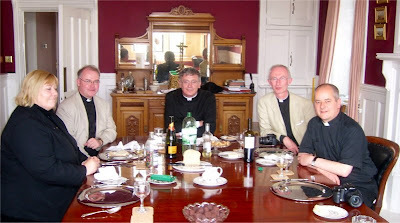 Some time ago, Fr Ray Blake kindly offered to host a meeting in Brighton for Catholic bloggers from the South. So after Mass today, it was off to Brighton via London Bridge. We had to change at East Croydon, a station I used to use every day when I went to school. At the meeting were Fr Ray (St Mary Magdalen, Brighton), Fr John Boyle (South Ashford Priest), Mac McLernon (Mulier Fortis) and Fr Sean Finnegan (Valle Adurni) - discontiued pro tem but closely related to another blog. Fr Ray treated us to an excellent lunch in the magnificent presbytery he has been left by his predecessors, clergy and laity. The SD card in my camera decided to have a hissy fit so I have shamelessly taken this photo from Fr Ray's blog. A good suggestion was that we might arrange a serious Catholic bloggers' convention, perhaps with someone to do with Social Communications.